This entry was posted in Google & CRM on February 14, 2014 by David Northmore. Do you have more than one websites? 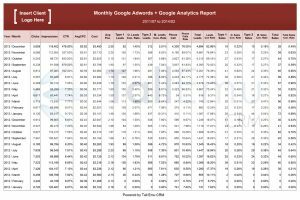 Have you ever needed to know what the rolled up Google Analytic stats are for each of your websites, but in a combined view (i.e. 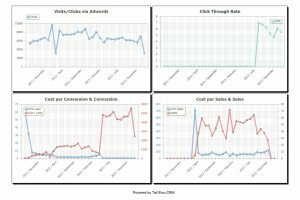 what is my total organic traffic across all my websites)? Have you every tried to doing this using Google Analytics? Well then you know that it’s impossible. You’ll have to run the report or reports that you need in each Google Analytics account for each website and then merge this data in excel. Well I am lazy and I hate doing things that just seem dumb and laboriousness when there should be an easier way. I searched high and low for a single application or software that did this. I found a few that said they did but where a nightmare to understand…so I gave up. That was until I recommend a client to have multiple websites as part of an aggressive marketing strategy to drown out their competition (and it worked). 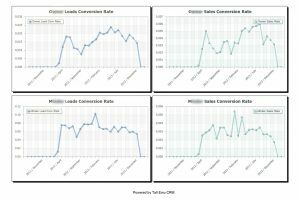 We built them 27 websites and I promised them that this was going to lead to more SEO traffic and a higher conversion rate (and it did) but now I had the mother of all jobs reporting on it. To stop me moaning, our top Business Intel guy and master report builder (you know who you are) took charge and made me this report. See the sample above. As you’ll see, its all the websites listed and the total revenue broken out by Medium. It also brings in data from the same period but for the previous year, to give some context. At the bottom you get the totals of all the websites combined. As much as I was happy, that my online marketing strategy worked, I will forever be grateful that this powerful report is available to me and my clients. 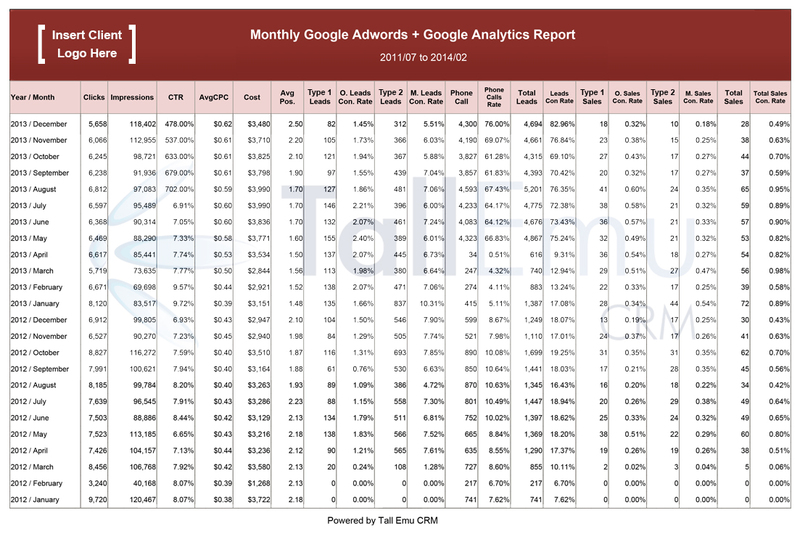 This report is really interesting and can’t be done using Google AdWords reporting. For this client they have multiple locations and their managers for these locations need to know how AdWords is going for them. The head office needs the total view. This report keeps everybody happy. This report is a year to date report and in this case starts in July and is run every month until the following June. This is usually just an addition to some of the other reports that I send them but its always useful to see how you are going as the year progresses. By bringing in Data for the same time frame but the previous year this gives everybody context on the data we put in front of them. This entry was posted in Google & CRM and tagged automated Google reports, crm adwords, CRM google, crm reporting, Tall Emu CRM on February 14, 2014 by David Northmore. 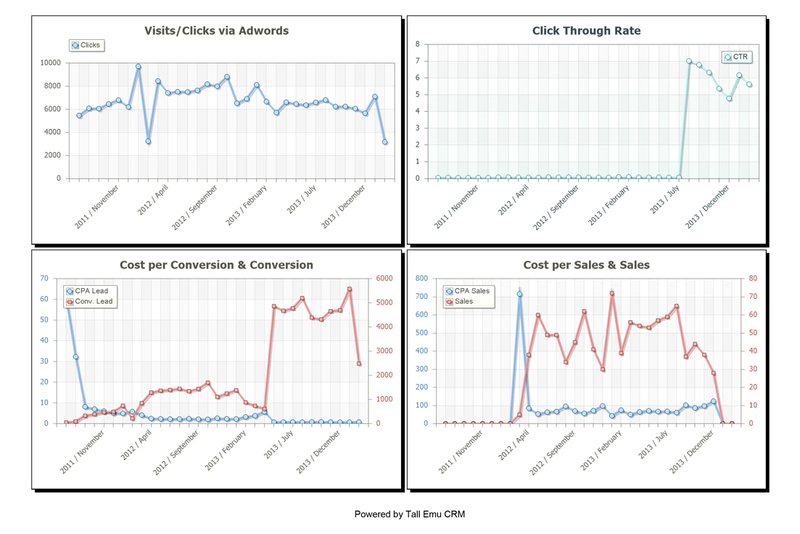 Using Google’s AdWords API we’ve pulled in data to Tall Emu CRM to build a report for clients. As you may know, its often the case that your AdWords account could be running lots of different campaign types be it targeting the display network, remarketing or generic and brand terms. 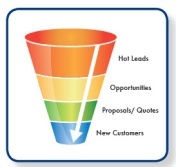 In the case of this particular client they have multiple locations which we run out of one AdWords account. As each location and each targeting method has different performance matrix its vital that you report on these separately. If you’re brave enough to put this level of detail in front of client its best to do so with context and I have also pulled in last months and the trend over the last 12 months. Now I know, some reports go over the top of the heads of some clients but this report is useful to me which is why I like it so much. 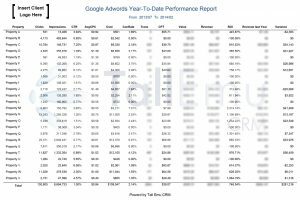 In time your clients will see the benefit of it too but you’ll have to explain why the details shows some of the weaker performing aspects of the AdWords account. 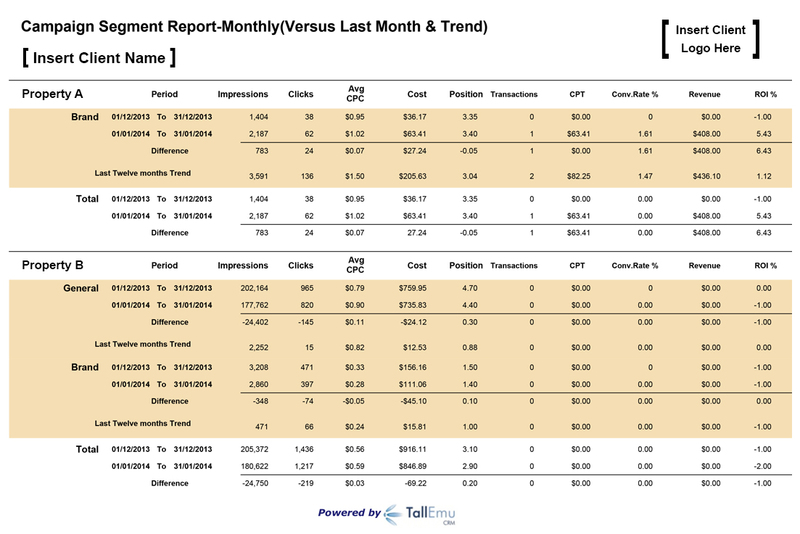 Reporting on topline account level performance is addictive but getting into the detail will help the optimization process and the depth of the conversation you can have with a client. 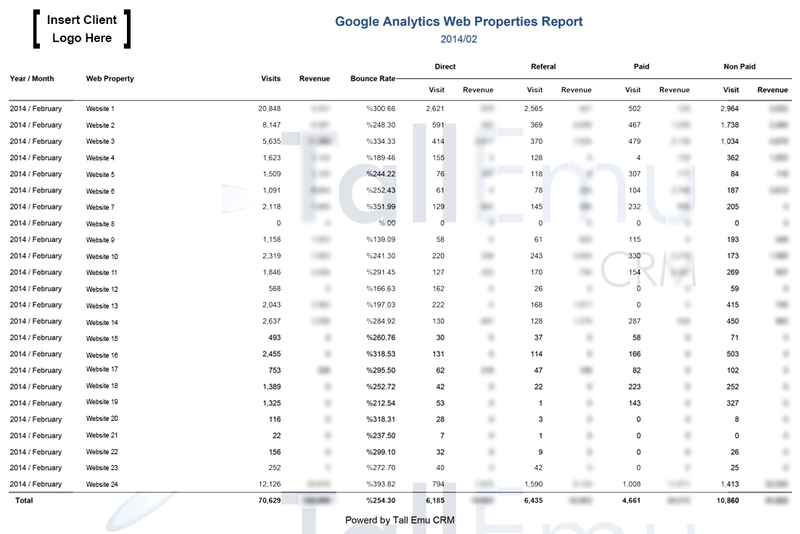 I simply can’t get this report in AdWords but Tall Emu CRM allows me to segment or group at will and bring in other data to give results the context they need to be useful. As with all reports in Tall Emu CRM they can be automated to run and send without me lifting a figure. This entry was posted in Google & CRM and tagged adwords, automated reports, combine Google Adwords and Google analytics, crm adwords, crm and Google, crm reports, Google, google analytics, Reports on February 14, 2014 by David Northmore. Being an online marketing consultant I am always running reports for my clients and for myself to gauge and monitor performance. Very often the data I need is in both the Google AdWords account and in Google Analytics account. 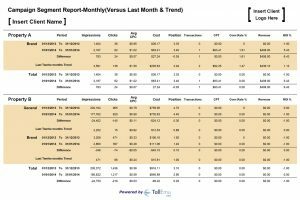 Usually there is no easy way to use their reporting tools to combine and order the data in one view; especially on a month to month basis. 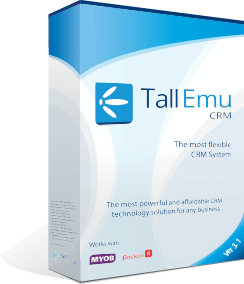 That’s where Tall Emu CRM has saved me heaps of time. Using Google’s API the Tall Emu CRM software has the ability to build almost any report if the data available to consume. I got this report built for a particular client and I love it. 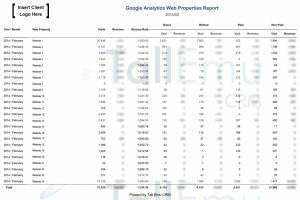 It is using both AdWords and Google Analytics data combined / merged into one report. 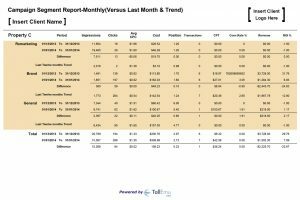 This report is a bespoke report, as this client has two types of customers and there is a separate enquiry and sales process for each. So we track and report on both separately and as a total; but this report brings all that into one report making the data more accessible and meaningful. 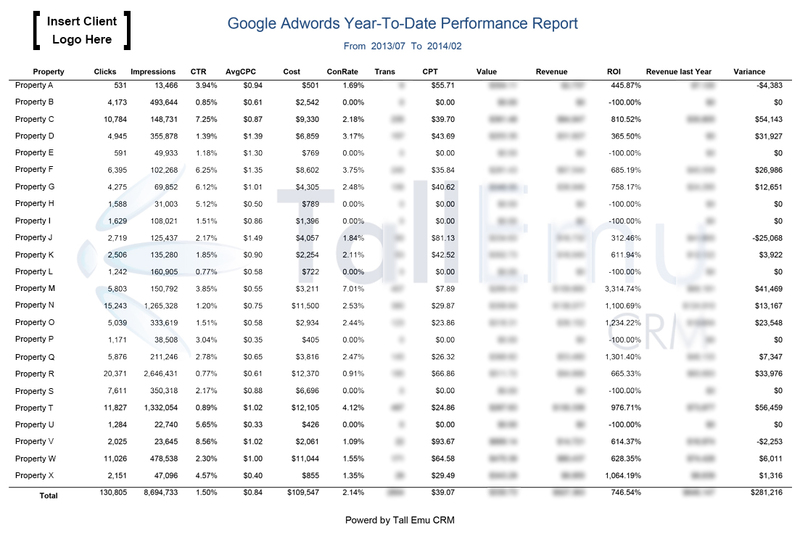 Just when you thought this report couldn’t get any better, we also bring in the “click to call” data that AdWords records but hides, into this report. 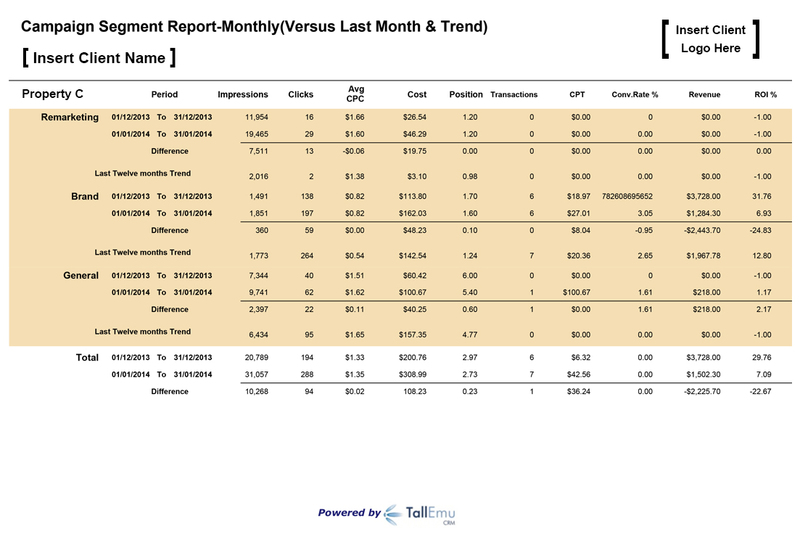 I’ve used variations of this report for other clients and they love it too. 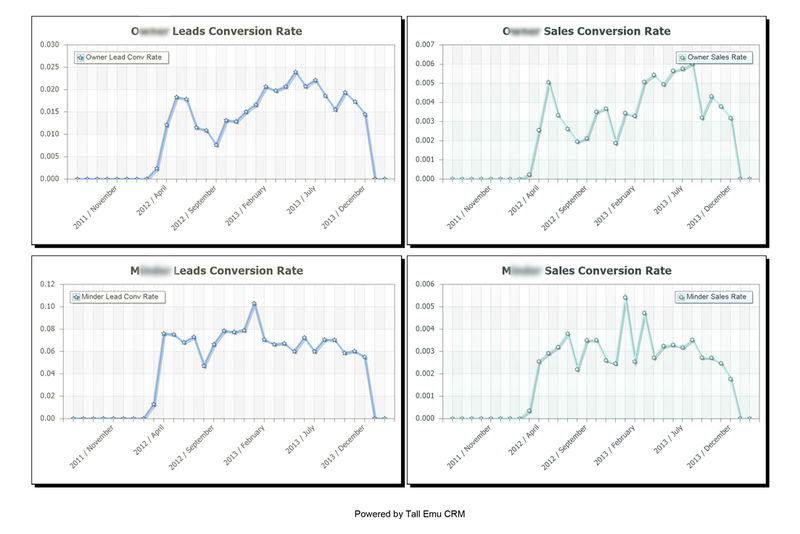 As I am a busy man, this report is automated and distributed using the Tall Emu CRM workflow. If you are an SEM / PPC agency or have multiple AdWords accounts under your stewardship then feel free to talk to us.